Neuro-Creativity is an educational art-science exhibition to improve public knowledge of Motor Neuron Disease, Cerebral Palsy, Cervical Dystonia and Brain Tumour, and current research on these conditions. It features unique artists who paint with their eyes or became artists after being diagnosed with a disabling disease. Descriptive cards from researchers accompany the artworks, to explain featured conditions, current research and available treatments. The private view (buy tickets here), with live music and free drinks, will be a unique opportunity to meet the artists. You will have the chance to know more about their work and personal stories. Artworks will be on sale – 20% of the proceedings will go towards adaptive equipment purchase, research and awareness-education. 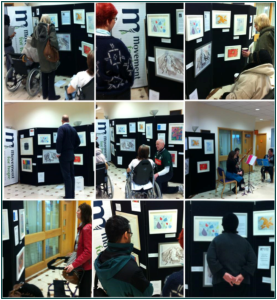 Aim: To raise awareness and educate about neurological conditions using art as a medium. The Tabernacle is fully accessible for people with disabilities, however they do not have a hearing assistance system. There is level access into the venue. Level access is present in most areas throughout the building. There are 2 lifts taking to all levels in the building. The Gallery is on the ground floor. There are Disabled Toilets available on both the Ground and First Floors of the Tabernacle. If disabled and attending the private view, you can contact the venue to arrange access to the venue prior to the main audience. For more information on venue accessibility, please contact Niki Kudar. For more information on the event, please contact Rohisha Luchun and Sarah Ezekiel.